This week at IHCC, we are cooking Mark Bittman's recipes. Who's Mark Bittman? Quoting IHCC: Mark Bittman, also known as The Minimalist, is a prolific cookbook author. He taught us "How To Cook Everything" with his pure and simple minimalistic approach. Nowadays he is teaching us about the benefits of conscious eating to improve both our own health and that of the world around us. I chose to bake his famous banana bread. And because I have an avocado which is going to be too ripe to eat soon, I add it into the batter. 1. Preheat the oven to 175°C. 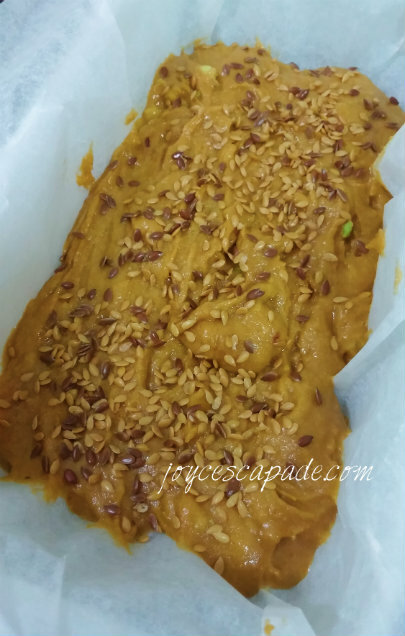 Line a 9”x5” loaf pan with baking paper. 2. Mix together both flours, salt, baking powder, and molasses sugar in a mixing bowl. In another bowl, beat butter with eggs, mashed bananas, and mashed avocado. 3. Stir in the banana mixture into the flour mixture. Stir until just enough to combine (you don't need to break up the lumps if any) but not over-mixed. Gently stir in vanilla extract. 4. 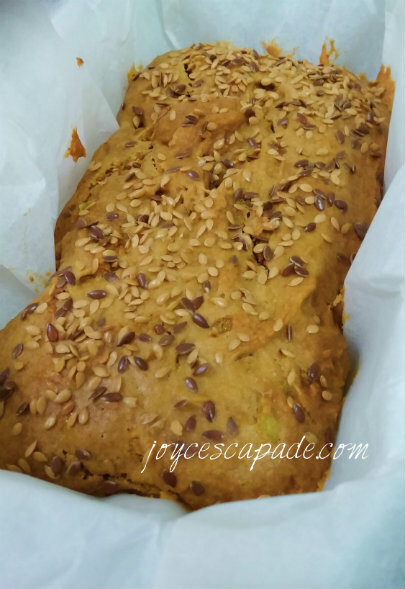 Pour the batter into the prepared loaf pan and sprinkle the top with flax seeds. 5. Bake in the preheated oven for 55 to 60 minutes, until the top is nicely browned or until a toothpick inserted into the center of the bread comes out fairly clean. Cool on a rack for 15 minutes before removing from the pan. 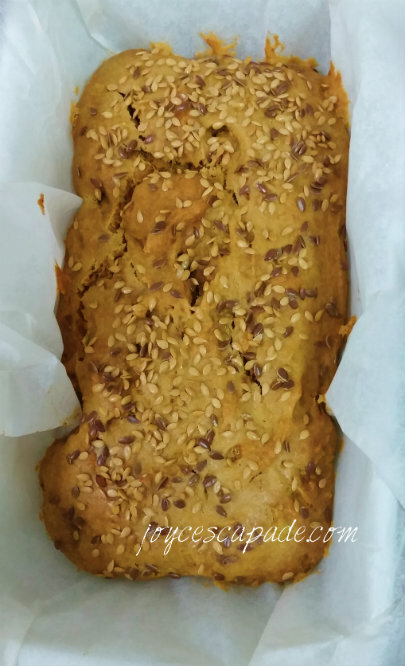 I love the aroma of freshly baked banana bread! Sliced and ready to be served. Can you see the avocado peeping at you? 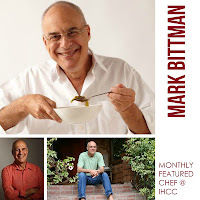 I'm linking this post with I Heart Cooking Clubs (IHCC) for this week's theme, Monthly Featured Chef Event: Mark Bittman. Ha ha ! You're so cute, Joyce. Ya I saw that avocado peeping at me lol ... yummy and healthy breakfast to start the day ! I saw the avocado peeing at me too! 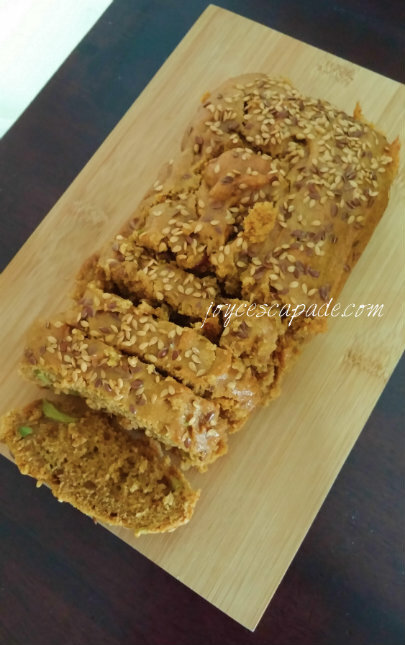 Wish that I can have a slice of this, the combination of avocado and banana sounds interesting! A lovely addition with the avocado! Nice! 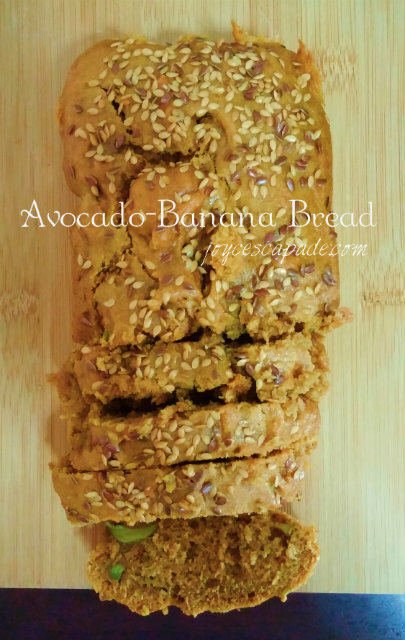 All the great ingredients of whole whaat, banana, avocado and flaxseeds make for a wonderful bread that I'd like a piece of. 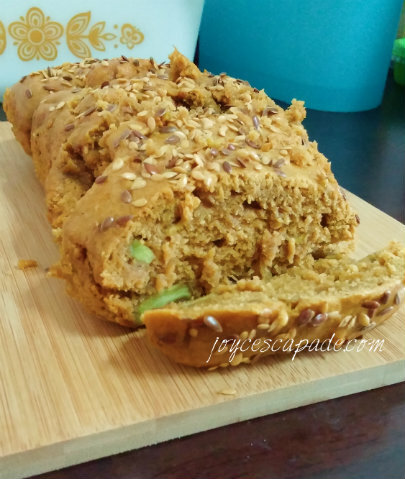 This is the first time I've seen an avocado mixed with banana bread. It must have been very moist and yummy.